Edema is a common health problem in India. It is also called oedema. In this disease, there is swelling of body parts due to fluid retention. It is the accumulation of excessive serous fluids in cells or cavities of the body. 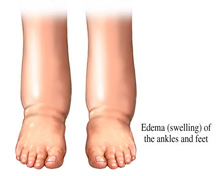 Major areas of body affected by edema are lower body parts, mostly foot and ankles. It can slow down the healing process, increase the chances of developing skin infection, affect blood circulation and can be painful. Edema is not categorized as a disease but it is an indication that something is wrong in the body. Edema is due to an underlying problem in the body. There are many causes of edema. It occurs due to water that gets trapped in the tissues of human body. Besides feet, ankles and legs, it also can affect the face and hands. Pregnant women and older adults often get edema, but it can happen to anyone. The body's organs have interstitial spaces where fluid can accumulate. Pulmonary edema occurs when an accumulation of fluid in the interstitial air spaces (alveoli) in the lungs. In addition, excess fluid sometimes collects in what is called the third space, which includes cavities in the abdomen (abdominal or peritoneal cavity - called "ascites") or in the chest (lung or pleural cavity - called "pleural effusion"). Anasarca refers to the severe, widespread accumulation of fluid in the all of the tissues and cavities of the body at the same time. Causes: There are various factors which can cause edema. Sometimes gravity pulls water down into legs and feet. Is a person sit in one place for longer period of time, it can lead to edema in the legs. Excessive salt intake in food makes the condition worse. Heart Failure, Anemia, Kidney disease, Low protein level in the blood, Liver disease, Malnutrition, Starvation for longtime, Thyroid disease, Weak veins, Medications, Pregnancy, Menstrual cycles, Immobility are some of the major causes of edema. This disease does not attack on sick person but healthy person can get edema but it gets cured automatically after some time. Heat and hot weather can also cause edema. Congestive heart failure and liver, kidney and thyroid diseases can cause edema. It is not an infectious disease. It is also not hereditary. Symptoms: The chief symptom of edema is non-inflammatory swelling of body parts, especially the foot and the ankles. When the lump is pressed it creates a hollow which takes some time to disappear. Medical practitioner can tell by examining patient whether he has edema. The skin over the swollen area may be stretched and shiny. Pushing gently on the swollen area for about 15 seconds will leave a dimple. If this happens, doctors recommend tests to confirm edema. Patients of edema exhibit symptoms of swollen feet and legs will as the day progresses, but after a period of time, the swelling will set in first thing in the morning and continue to deteriorate throughout the day. Long-term edema causes pitting. When patients press on the swollen area for a few seconds, they will notice an indentation in that area. If swelling continues, it can cause skin ulcerations. Other symptoms will develop such as High blood pressure, headaches, increased urination, palpitations, swollen hands and/or wrists, puffy eyes, weight gain. Diagnosis: A doctor diagnoses edema on the basis of the symptoms shown by patient. In high-altitude pulmonary edema, fluid can sometimes be heard in the lungs through a stethoscope. Many tests like an x-ray of the chest and measurement of the amount of oxygen in the blood can help to confirm the disease. Pulmonary edema in the lung can be diagnose by exposing a lung under investigation to infrared radiation, especially near-infrared radiation; measuring the reflected radiation scattered by the lung as a spectral response to the presence of water in the lung; comparing the reflected radiation with calibrated values and evaluating occurrence of pulmonary edema from the comparison. Liver function tests such as SGPT, SGOT, Alkaline phosphate must be done to check liver disease and serum protein electrophoresis and tests for BUN and creatinine should be done to exclude renal disease. The urinalysis is very important both for the routine studies and also to examine the urinary sediment for diseases such as chronic glomerulonephritis and collagen disease. If there is excessive loss of protein in the urine, one should be considering nephrosis. An EKG, chest x-ray, and venous pressure and circulation time will be very helpful in diagnosing congestive heart failure, but pulmonary function tests can be done as the vital capacity is significantly reduced in this disease. When there are great chances of congestive heart failure, echocardiography or radionuclide-gated blood pool scintigraphy should be done to decide the left ventricular ejection fraction. It is recommended by doctors to do a thyroid profile to diagnose myxedema. A CT scan of the chest will be helpful to diagnose constrictive pericarditis. rarely, patients have edema due to an abdominal tumor. A CT scan of the abdomen and pelvis must be done in such cases. Contrast lymphangiography may be necessary to diagnose lymphedema. Treatment: According to doctors, there is no possible treatment for edema. Doctors only facilitate to control the condition that is causing it. There are some activities that can be performed by edema patient to improve the condition. They must put a pillow under legs when lying down. It is advised to wear support stockings, which they buy at most drugstores. They must put pressure on legs and keep water from collecting in legs and ankles. They are not allowed to sit or stand for too long without moving. They must follow doctor's guidelines. Doctor sometimes suggests taking a medicine namely diuretic, which is also called a water pill. It is important to tell doctor if person is suffering from edema. If this disease in not controlled with in time, person's skin may keep stretching, which can lead to other problems. Patients rush to doctor if they have edema and they start to have trouble breathing. If lady is pregnant and she observes edema, she must immediately call doctor to control this disease. 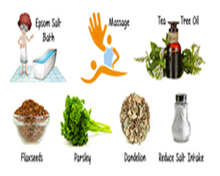 Home Remedies for Edema: Appropriate diet is always helpful to treat any disease. It is advised that patient must eat low carbohydrate diet because carbohydrate has more water content. Since salt causes body to retain water, therefore it is better to avoid salty food. Protein and fat rich food is good for edema patient. Patients must avoid fruits and vegetables because they increase the fluid level in the body and eat low-sodium diet because medicines will be unsuccessful if they eat high-sodium diet. Regular exercise is necessary to keep body engaged in physical activities. This will help to get rid of unnecessary fluid in body cells and cavities. Patient has to leave smoking and drinking alcohol. Note: This information is just for knowledge of disease. If such type of medical condition develops, consult your doctor.